DUMBARTON earned a point in their final match of a successful Ladbrokes Championship campaign which saw them finish the best part-time team in Scotland for the fourth year. Sons finished in eighth place on 37 points, six points ahead of full-time Livingston in the play-off position and sixteen ahead of relegated Alloa Athletic who hosted this final game on the artificial surface at the Indodrill Stadium. The result was 1-1, with ex-Sons assistant manager Jack Ross's new charges giving a very creditable display. The opening goal for the Wasps came on seven minutes when a defensive midfield lapse put Sons central defence under pressure, which allowed young striker Isaac Layne to score with a clever finish. Sons, without the injured Christian Nade, struggled to make an impact up front, and rarely troubled Scott Gallacher in the home goal. However on 30 minutes Tom Walsh had a great chance after good work by Kevin Cawley, but his looping shot went wide. 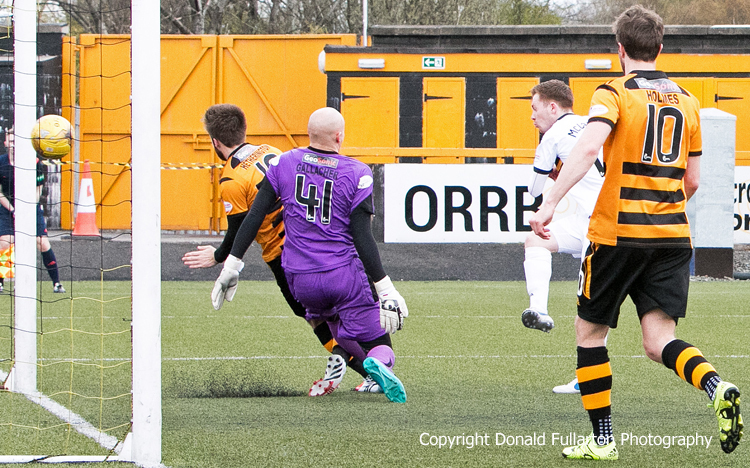 Alloa came close to a second, but Layne's effort struck Jamie Ewing's right-hand post and rebounded into the keeper's arms. Steven Saunders thought he had equalised with a close range shot, but he was denied by a tremendous Gallacher save. Minutes into the second period teenage striker Donald McCallum, on for Garry Fleming, equalised from close range to bring Sons back into the game, scoring the club's first away goal of the calendar year, and what turned out to be their last goal of the season (pictured). Both teams had chances to win, most notably Paul Heffernan who found himself free inside the six yard box, but his shot was easily saved.